Many people don’t know that shipping containers can be used for more than transporting merchandise. You can actually build residential dwellings and custom designed homes by assembling old shipping containers! 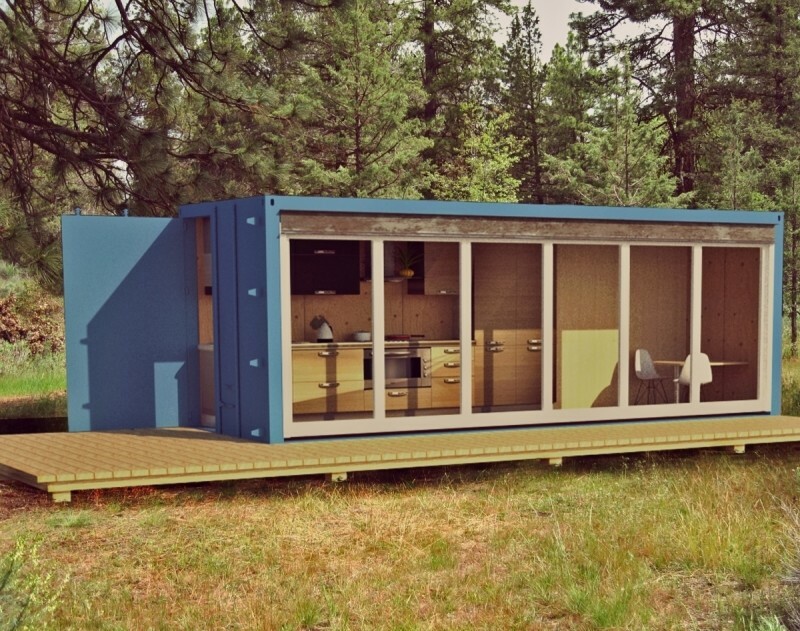 Not only can you build a fully-fledged, custom-designed home with all the bells and whistles of traditional construction, but even modern and trendy coffee shops, office spaces, apartment buildings, schools, and emergency shelters can be constructed utilizing re-purposed shipping containers. 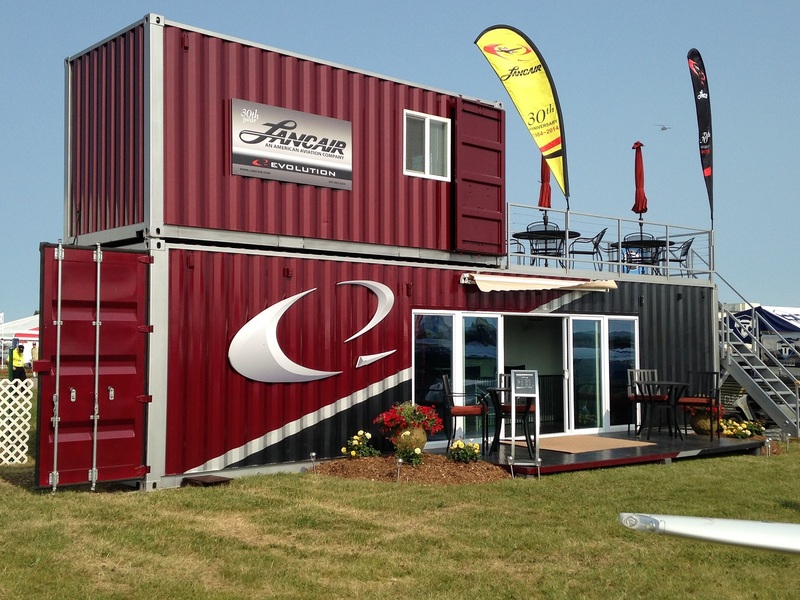 According to 24h plans, there are two standard sizes for shipping containers: 20 x 8 x 8 ft. covering a surface of 160 sq. ft. and 40 x 8 x 8 with a surface of 320 sq. ft.
A used 20-footer costs anywhere between $1,400 and $2,800, whereas a 40-footer costs $3,500 – $4,500. You will also have to pay for labor (about $50-$150 per hour) and for the modifications needed to make the container livable. Expect to pay at least $10,000 for labor, more likely $15,000 per container, plus permitting, planning, structural engineering and architectural design fees. Located in Denver, this 2,192 sq. ft house was built with 7 containers and it was sold for $679,000. 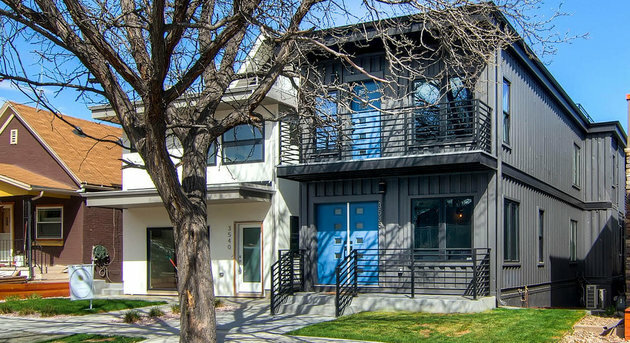 Many people argue that shipping container house designs would somehow upset neighborhood associations because they don’t usually blend in with traditional homes. We don’t think you should be concerned in the case of this house because it looks just like a regular home, the one difference being that it’s made of metal. The house has a two-car garage and 2.5 bathrooms, which is more than ideal for a family of four or five people. If you take a look inside, you will find the master bedroom that’s connected to the rooftop through a spiral staircase. There are 2 additional bedrooms, a large living room with a kitchen island, and of course an office space for whoever works from home. Built in California and designed by Leger Wanaselja Architecture, this shipping container house that looks stunning at dusk, measures 1350 sq. ft. The three re-purposed shipping containers were insulated and modified to make the structure of this beautiful home. Note the large windows that allow inhabitants to make use of natural light as much as possible. They also direct the attention away from the metal containers. The roof is flat which is pretty much what you would expect from a shipping container house. This design also blends in a traditional neighborhood. The Missouri University of Science and Technology built this design with 3 shipping containers to compete in the Solar Decathlon in 2015. For those of you who don’t know, this is a competition where countries from all over the world are trying to build the most self sufficient house. So, you will probably not be surprised when I say the house has photovoltaic panels, an HVAC system, a grey water collection system, automated lightning and 3 hydroponic gardens. As for design, the metal is covered with refurbished shipping pallets, while carpeting is made of reused fishing nets. Insulation consists in recycled denim batting. This design features entire walls made of glass. Some would argue that it makes the house less energy efficient, but this can be resolved by purchasing Energy Star windows. There is a small porch near the entrance door where you can put some outdoor furniture and enjoy a relaxed meal with your family. Inside, the living room is very spacious as you can see in the pictures showed by the source website. The metal walls were painted in a light blue shade to mix with the rest of the interior design elements while creating a warm feeling of harmony that is not what you would expect when looking at the exterior of the building. Built in the Mojave Desert, California, this house is made of 6 shipping containers and actually has its own water tank that can hold up to 10,000 gallons of water. The construction is protected against wind and fire by a steel shade canopy with an integrated metal framing system. The architects made sure the house withstands a harsh climate like the one of the Mojave Desert so they made it sustainable while keeping the afferent costs in mind. According to the guys at Ecotech Design, the construction costs were far below the ones of a comparable prefabricated or manufactured house. 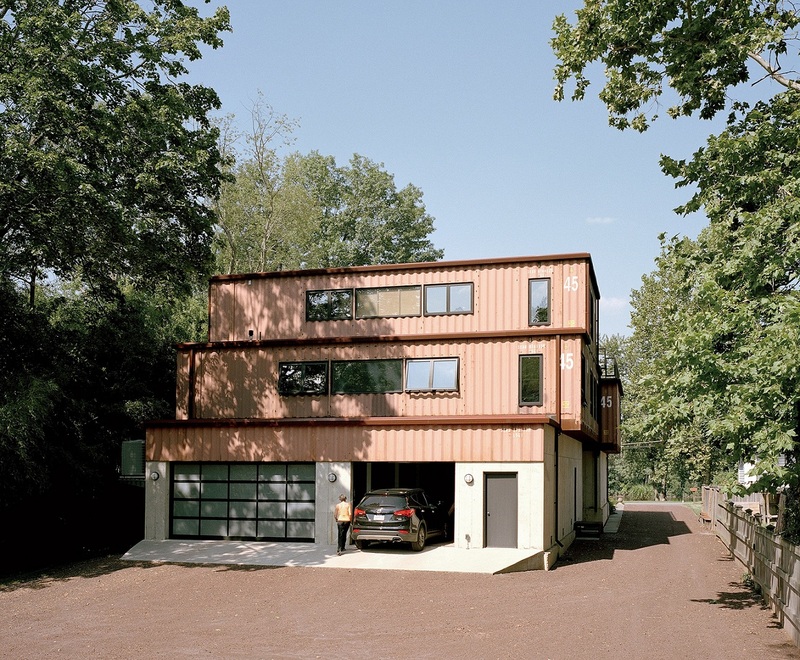 It took 6 containers to build this house: 4 for the ground floor and 2 on top of those. The latter make the dining room, living room and an open kitchen. Both the ground and upper floors offer some outdoor space: you can see the balcony and the ground deck where the owners have actually installed a swimming pool. The inside walls are painted white which combined with the white oak floors make the rooms look very elegant and also spacious. The house has energy efficient windows, Energy Star appliances and white thermoplastic roof with spray foam insulation. Focused on sustainability, the “dwell” design from G-pod is easy to build and affordable at the same time. According to G-Pod, the house features a patented mix of pull-out sections and a fold-down covered deck where you can enjoy a coffee without being bothered by your daily troubles. You will notice that basically the entire facade of the house can be opened to ensure effective ventilation. The house is not big but it can expand 3 times its original size. The house is fully operational off grid, so it’s perfect for anyone who wants to live in remote areas. You can already picture yourself living in this small container house in the heart of the mountains. The main costs are related to making an ordinary shipping container livable and to making the house self-sufficient (assuming you actually want to live in the heart of the mountains or in a similar remote area). Given its size, you obviously can’t expect having a real kitchen but you can fit in there a microwave and an electric stove. This out of the box design gives you plenty of living space both indoors and outdoors. The staircase that leads from the ground directly to the top floor sets this house apart and so does the color of the shipping container. The architect incorporated multiple containers stacked on top of each other to create a sophisticated space that still costs less than many conventional houses. This is a huge container house with a unique design that most probably costs several thousands of dollars to build. If you are looking for a luxury house that costs less than traditional houses of the same size, you won’t fail with this design. You do need a lot of land property to pull this off but remember that it’s not going to be occupied by your house considering that the only segment of the house that sits on the ground is the small brown container. So, you will have a big beautiful yard for your kids to play in during warm days. This ample shipping container house design not only that gives you plenty of space indoor but also focuses on outdoor space and I am not talking here about the space around the house. There is a deck connected to the ground through a separate shipping container with glass walls and a staircase inside. The round windows combined with the metal appearance of the structure remind you a bit of a ship sailing through deep waters. The color of the house resembles a lot the one of typical shipping containers as if the viewers should be made fully aware that the structure is made of used cargo containers. If this doesn’t sound appealing, you are free to choose another color or to mask the metal with wood pellets while contributing to the insulation of the construction. This design might have some problems integrating into an American neighborhood because Americans are not very keen on having transparent glass on 3 of the 4 walls of the house. This sounds more like what people from the Netherlands or Belgium would do. You will see that many people don’t draw their blinds even if the house is on a busy street. So, combined with their big windows, anyone who walks by their house can basically see everything that’s going on in there. The solar panels installed on the roof can take care of the electricity needs of the house. The number of inhabitants is limited to 2 people because of the relatively small space available. However, this doesn’t mean you can’t live comfortable in there considering that an experienced interior designer uses space efficiently. For example, you could have a couch instead of a bed or your could buy a bed that rolls up the wall. This is just one of the many things you could do to make this house comfortable. This house can easily accommodate a family of four and you also get a garage, which is not very common for shipping container houses. Its design is not extravagant so that you don’t have any trouble with neighborhood associations. It’s a simple house made of stacked shipping containers that is cheaper than other houses of the same size. Proper air ventilation might be a problem in this house considering that the windows are quite small, but it looks like there is a roof deck in the back, you can’t really tell this in this picture. If that were the case, you would have a place to add some chaise longues where you can relax with a margarita in your hand. These containers don’t look used at all, they are either new or amazingly reconditioned. You have a small deck in front of a big glass sliding door where you can enjoy some fresh air and another deck on top of the first floor that’s big enough to hold a small party. Note that there actually is an exterior staircase so that guests don’t have to go through your house to reach the upper deck. If you have a view, then the upper deck is very welcome. This construction could also be used as a cafe downstairs and a small place to live upstairs. This small business could keep you afloat financially until you reach a point where you can actually afford hiring a manager so that you are just the owner who collects the profits. If you live in an area with hills or even surrounded by mountains, this design should be on your list because it tackles the problem of uneven terrain. So, if you have some sloping land that can’t be used for anything, you have just got some great news. The solution is simple and practical because you also get a lower floor that you can use for storage or even a small bedroom for the kids. 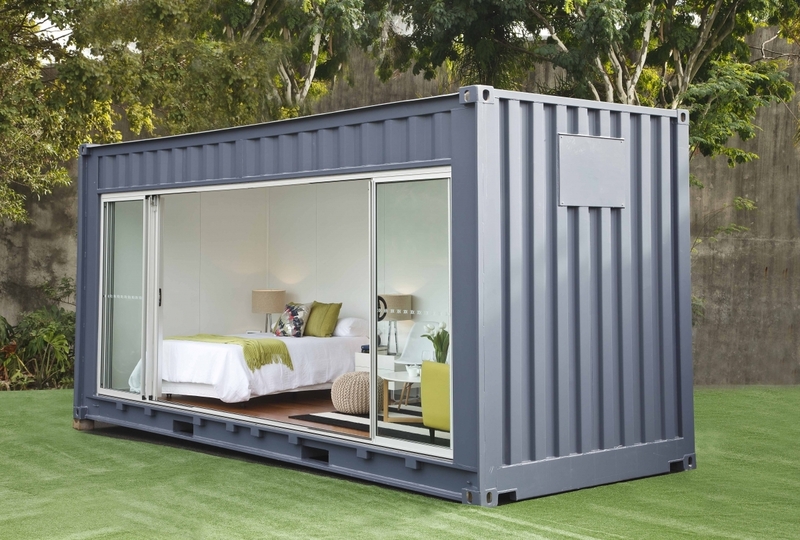 Just make sure to add windows, if you plan on using the lower container as living space. The roof is sloped which is a perfect feature for people living in areas where it rains or snows a lot. The structure is solid even though it might not look like that. This affirmation is supported by the fact they used all steel truss system and steel roof sheeting. Moreover, there are vertical posts for reinforcement. You can find out more details at the above website. In spite of concerns regarding insulation and stability, shipping container houses have proved to be durable constructions that don’t necessarily have to be ugly. There are plenty of examples above that would integrate in a regular neighborhood. Besides, you can use salvaged materials thus protecting the environment and giving those containers a new way to be useful and shine. Nobody prevents you from getting brand new containers from China, but this increases the costs of the house. Nonetheless, you are able to build the home of your dreams without paying a fortune in the meantime. Previous Previous post: Engineered Wood Flooring – The Best Compromise for Wood Flooring?